While we actually didn't mind the color, this was just gray tinted KILZ to get the door ready for the real color. It did look kind of cool, though! I was pretty impressed with the coverage after just one coat! The dark primer was the bomb, plus the paint was really high quality. I ended up doing two coats...then I had to tackle the hardware. When I had originally removed the door handle, it was looking really old and rusty on the inside, but I thought it was too cool to replace. Plus I didn't want to cry when new hardware wouldn't fit and we'd have to drill all new holes. You know? So I decided to use a wire brush on the rust, then spray it all with primer and Rustoleum 'Dark Bronze' spray paint. I also thought about not putting the eagle door knocker back on, but I have to admit I kind of love him and he probably is original to the house...so he got a couple coats of paint, too. and here it is all done! So what do you think? Is the red too predictable? We have gotten lots of complements from the neighbors so I think I made the right choice. I will also take your opinions on the eagle. If I'm a total weirdo and it's way ugly, please let me know! And maybe you would like to see my post last year pondering what color to pick? Check it out here. 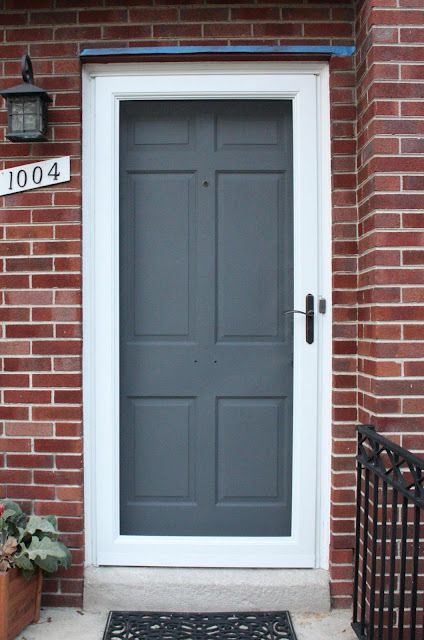 I think it is great that you put Mr. Eagle back on the door:)and the color you used for the door & the fixtures are great. I like the eagle, he cleaned up nicely! The door looks great. i like the red door, it looks really nice with your house. and i also like that you kept the eagle, he looks much better after a coat of paint! The eagle is super charming! Now I want a rad doorknocker! The door is awesome. I love a red door. AND the eagle is fantastic! Glad you kept it. Pretty! If you were gonna throw that knocker away, I would grab it. It's unique and it's very cool! 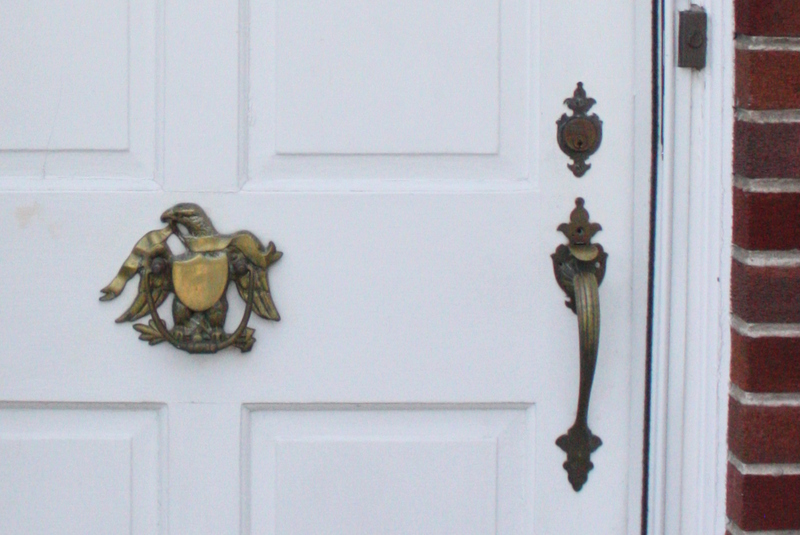 Love the door and the eagle is perfect. It's great to preserve what came with the house when you can. I love the red door!! But then I think all front doors shuld be red, so my opinion is a bit biased ;) My front door is Red Red Wine by Behr and matches the color of my dining room also (since that's the first room you see when you walk in) And I vote that the Eagle stays - you don't see too many of them anymore. I love the red door! It's very charming. I love how fabulously charming the red paint & the eagle are. Keep the eagle!! As Mr FC says, if you don't, then the terrorists win. Love the color, love the eagle! You are right on in my book. have to go against the grain on this one...i was WAY disappointed to see the eagle go back on the door. if i was walking by it would make me think some old folks lived there! I love the eagle and the color. They both look great. 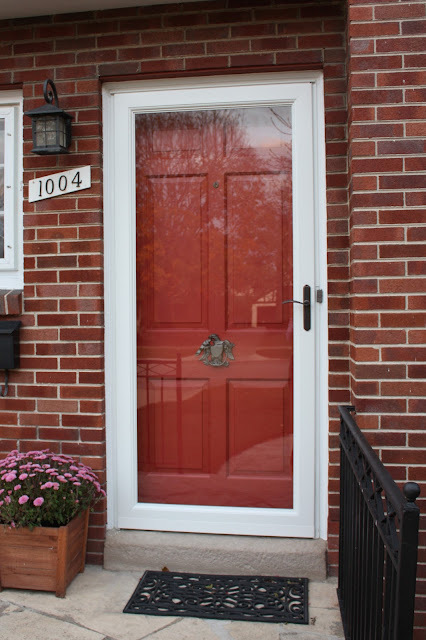 I love a red front door and it looks great on your house (although the gray primer was pretty spiffy, too)! Every home needs a little quirk and I think the eagle is just right. Girl, you can do no wrong! The colour is great too! So perfect for your house! I love the eagle and the door color! Looking good! Seeing as how I have a red brick house and red front doors...of course I love yours! Great job cleaning up the hardware too..I'm too chicken to even take mine off! I love the red color. Great choice. The door really pops now. And, the eagle looks great with a new color. Great punch to the front. So love the red! And that eagle is so unique. i think you made the perfect choice in keeping it! Love it! I have a red door, too. I'd love to get crazy and do a yellow, green or pale turquoise, but my little 50s ranch just wouldn't have it. It'd be like wearing a poodle skirt with a mohawk. I love it! The color is perfect, and I really love Mr. Eagle, too. He's too cool! Keep the eagle. He is cool! The red looks great, too. Nice choice. I love the updated door. You've really inspired me to get out there and fix ours up. The color is great but the hardware and the light fixture are really embarrassing! Looks like everyone likes the eagle (I like him too) which means if he is staying you must give him a name. I love the door!! I have always been a big fan of red doors - there is something so homey about them. Although, lately I am really craving a yellow door. Ahhhh, it's perfect with the rest of your house, and against the white storm door frame! I actually think that Antique Red was one of the colors I was considering for our front door, before I chose a plum color.